We have seen earlier that we can represent the angular momentum states using the quantum numbers j and mj Now, suppose we have two sources of angular momentum represented by and J . How may we represent the composite state? 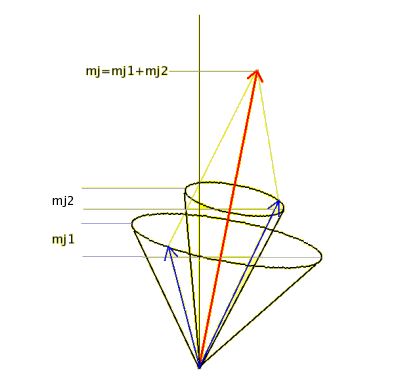 j1, j2, mj1, mj1 are the quantum numbers for the two angular momenta observables, and . mj = - j to + j in integral steps. Similarly, mj1 = - j1 to + j1 in integral steps and mj2 = - j2 to + j2 in integral steps. The two representations can be visualized pictorially using the vector-model of coupled angular momentum. First we show the uncoupled representation below in the form of an animation. Look carefully at the animation. The two blue arrows attached to the sides of the two cones represent the two angular momentum vectors and . The red arrow represents the total angular momentum . | |, | |, the z components J1z and J2z respectively, all remain fixed. However | | and its z component Jz do change. Hence in this representation, the corresponding quantum numbers j1, j2, mj1, mj1 may be specified together but not with j, mj. Next we show the coupled representation below in the form of an animation. Look carefully again at the animation. 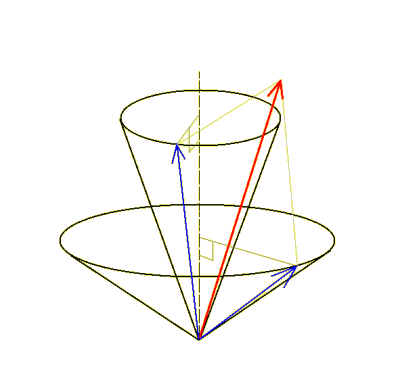 The two blue arrows attached to the sides of the two cones represent the two angular momentum vectors and as before. So does the red arrow represent the total angular momentum . However note now that the two cones are now tilted to the vertical z-axis and have as their common axis. | |, | | remain fixed but the corresponding z components J1z and J2z vary. However | | and the z component Jz remain fixed. and remain locked together, the angle between them remaining constant. Hence in this representation, the corresponding quantum numbers j1, j2, j, mj may be specified together but not with mj1 and mj2 . Also note that although mj1 and mj2 vary, their sum, mj remains fixed. Quantization of angular momentum has many interesting fall outs as we shall see subsequently.